As I was making this, I couldn”t decide if I should put some more pigs in the backgrond. Looking at it now that it’s done, I think I might go back in and add some. Maybe. There’s already a lot in there and I don’t want the panels to get too cluttered. This entry was posted on Wednesday, February 13th, 2013 at 12:00 am and is filed under Comics. You can follow any responses to this entry through the RSS 2.0 feed. Both comments and pings are currently closed. Is his only ability to make rocks? False. 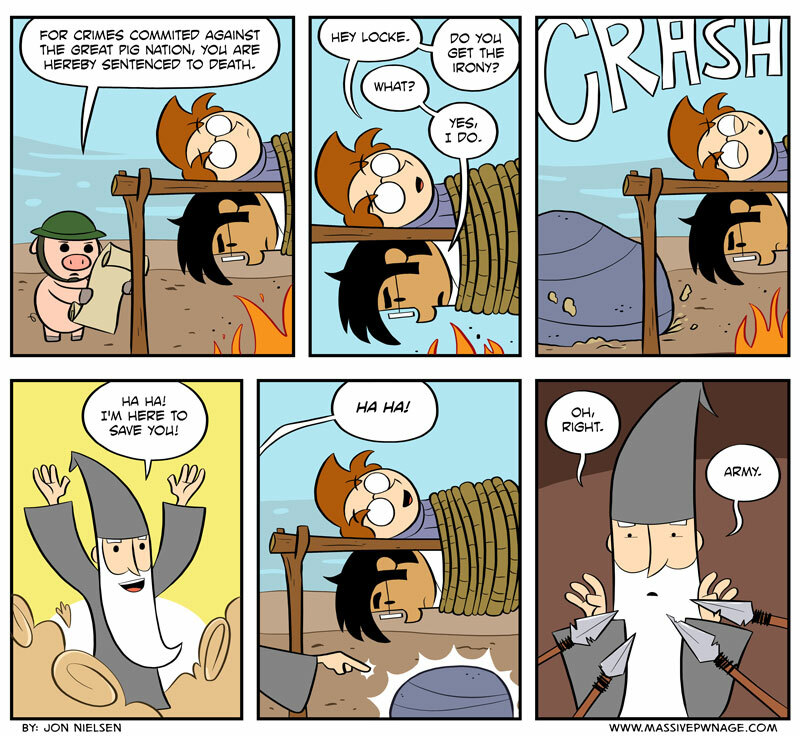 The Wizard can also grow a sweet beard. It may just be me, but I’m not getting a next button to get here from Mondays comic. I had assumed there was a delay in publishing the comic until I noticed a link to it from your Facebook page. Even now, if I go back from this comic there is no button from there to here. The comic does show up in the archive though. Dang, well that’s fantastic. Like, today’s comic wasn’t showing up on the front page at all? I don’t think I’ve ever had a problem like that, but the site probably knows that I’m the admin. Does it work now? Maybe it just took some time to fix itself. Did the newest comic button work? I honestly don’t know how I would even go about fixing something like that. Thanks for letting me know, though. At least I know that problem exists now. It works fine on my computer, maybe it’s just his browser or something, because mine isn’t having any problems. I think its fine the way it is currently. You can add more pigs in the next comics, we all know they’re there.